The product of a fascinating collaboration, the Atmos 568 is the embodiment of lightness. 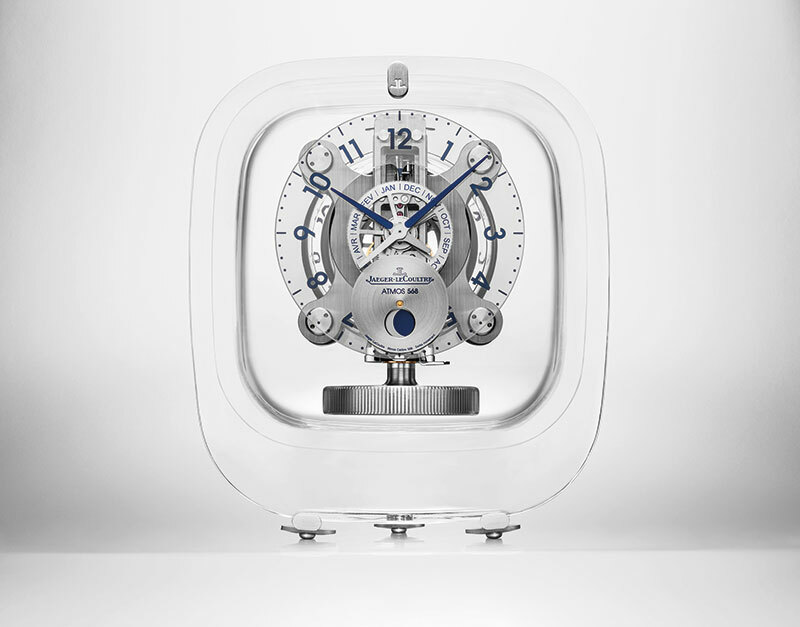 The silent, transparent clock, designed by Marc Newson, is characterised by a Baccarat crystal cabinet that allows light to stream over the mechanism, while also creating its own subtle play of reflections. This draws the focus even more toward the stunning perpetual moon phase indication. The calibre 568 mechanical movement, made up of 211 parts, is manufactured and assembled by hand. The Legacy Machine Perpetual turns the traditional perpetual calendar system on its head by using a mechanical processor instead of the conventional space-consuming ‘grand levier’ system architecture. Its open dial reveals the full complication and, with the help of a system developed exclusively for this piece, the sub-dials appear to float above the movement with no visible attachments. 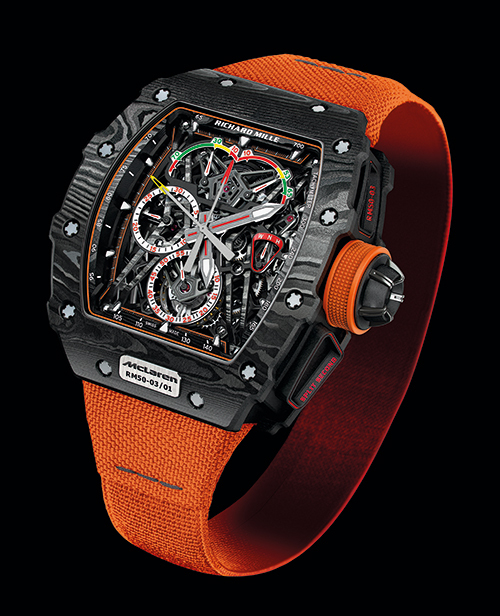 The first wristwatch made in Graph TPT, a proprietary composite obtained by injecting a graphene-containing resin into layers of carbon fibers, the RM 50-03 Tourbillon Split Seconds Chronograph Ultralight McLaren F1 is the lightest of its kind in the world. Weighing just 38 grams, strap included, it comprises a manual-winding tourbillon movement, torque indicator, torque limiting crown and a rubber strap injected with graphene to improve its elasticity and longevity. 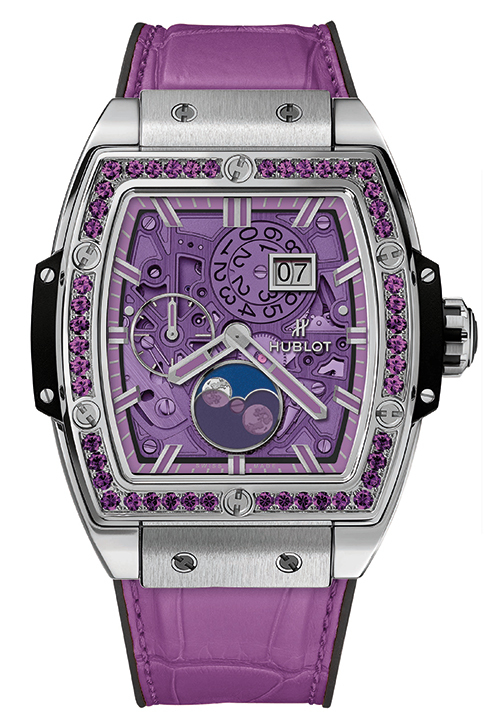 The on-trend Spirit of Big Bang Moonphase can be flaunted in whatever hue suits your style, from indigo blue and bold purple to bubblegum pink and vibrant orange. Its iconic 42-mm tonneau case holds a hand-wound skeleton movement and a cutting edge quartz dial with a hardness of 7 on the Mohs scale. A semi-transparent disc reveals two alternating moons, in matching shades. The lunar cycle is reproduced in a large round window, completing one revolution every two lunar months. A rotating globe with day/night indication and a precision moon phase display are the highlights of the Tri-Axial Planetarium besides the innovative tourbillon it is named after — equipped with a regulator operating on three rotation axes instead of just one. All the indications are displayed on a guilloche silver-toned dial, bearing a motif evoking Earth’s meridians, which is punctuated by pink-gold numerals and hour-markers. 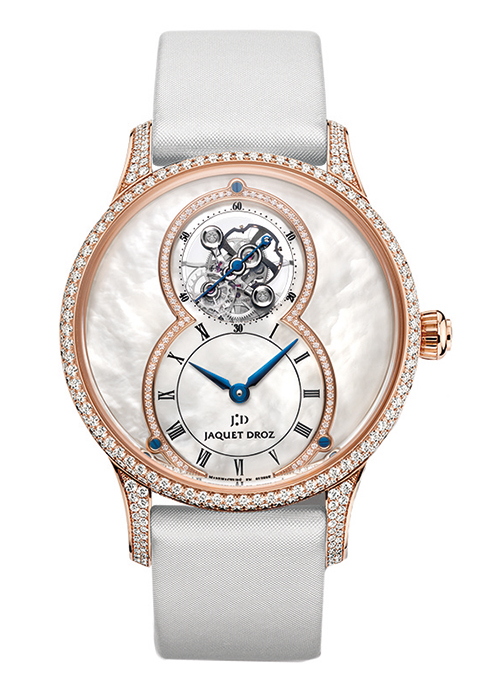 Luminescent and precise, the Grande Seconde Tourbillon Mother-of-Pearl features a silicon balance spring and pallet horns, making the tourbillon rust-proof and insensitive to magnetism, temperature changes and atmospheric pressure. Laid on a white satin strap, the red-gold case is set with brilliant-cut diamonds that echo the ones on the gleaming dial. The Excalibur Spider Pirelli – Double Flying Tourbillon is ideal for fans of fine mechanics, with its transparent view of the new RD105SQ hand-wound calibre featuring a blue version of the brand’s signature Astral Skeleton bridge. 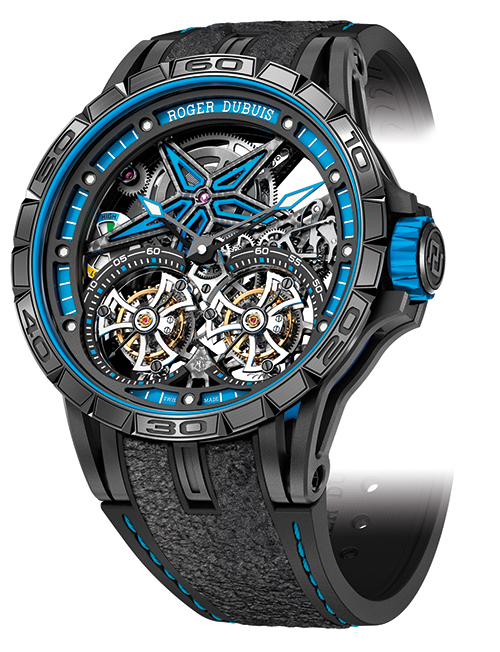 The two flying tourbillons — at 5 and 7 o’clock — are rimmed by speedometer-like seconds counters, and a multicoloured power reserve indicator is a cool nod to race car cockpit fuel gauges. Three complications make up the single silver-plated dial of the Da Vinci Tourbillon Rétrograde Chronograph, the red-gold case, push-buttons and lugs of which are designed in a beautifully balanced way. 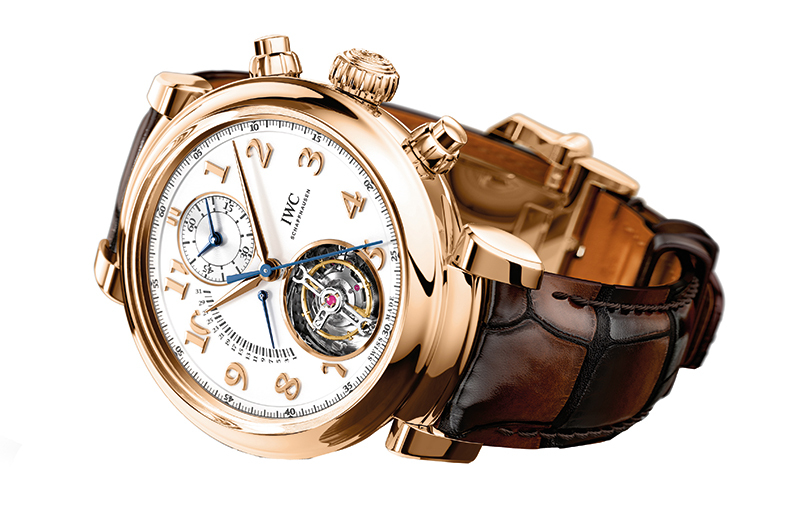 Its new IWC-manufactured 89900 calibre also has a solid red-gold rotor, and its dark brown alligator leather strap by Santoni fits perfectly around the wrist. The fifth masterpiece in the watchmaker’s Pour le Mérite series, the Tourbograph Perpetual Pour le Mérite combines the fusée-and-chain transmission with a tourbillon, a chronograph, a rattrapante function and a perpetual calendar. 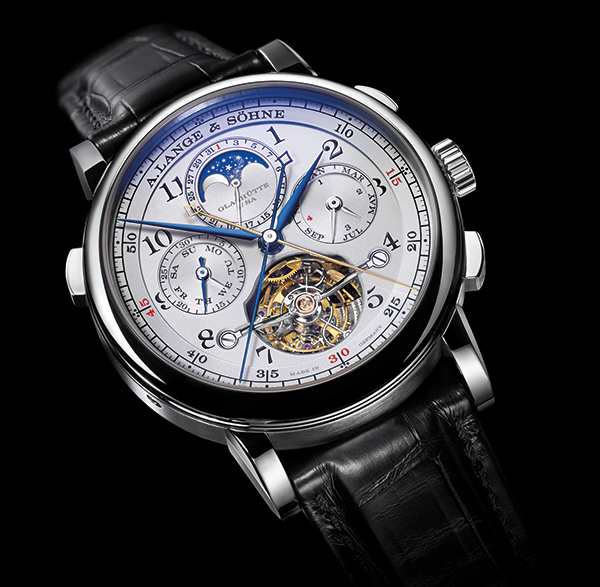 The limited edition model also boasts thermally-blued screws, bridges and plates made of untreated German silver and decorated with Glashütte ribbing and perlage, as well as a hand-engraved chronograph bridge. Not only is the Cellini Moonphase the first presentation of this complication from the brand since the 1950s, but it also flaunts an actual piece of meteorite. 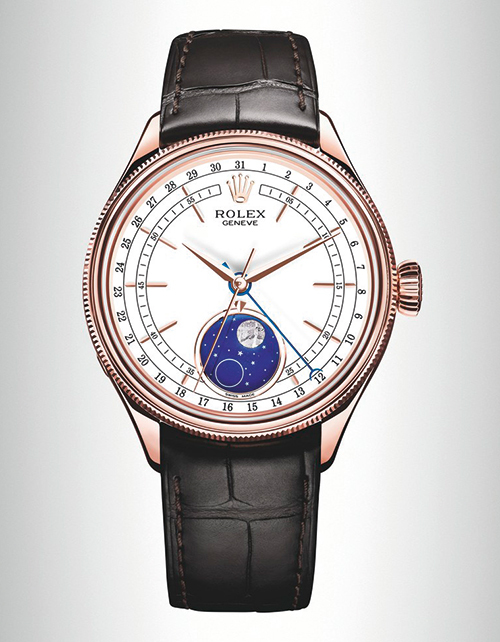 Depicting the moon, it sits on a blue enamel disc at 6 o’clock on the watch’s white lacquer dial with rose-gold hour markers. The self-winding mechanical movement is manufactured entirely in-house, since the brand’s patented moonphase module is astronomically accurate for 122 years. A grand complication with a tourbillon and perpetual calendar in addition to a running equation of time, the Marine Équation Marchante 5887 exceeds expectations. The last of the features serves to differentiate between mean solar time (civil or standard hours and minutes) and true solar time (the actual solar hours and minutes). 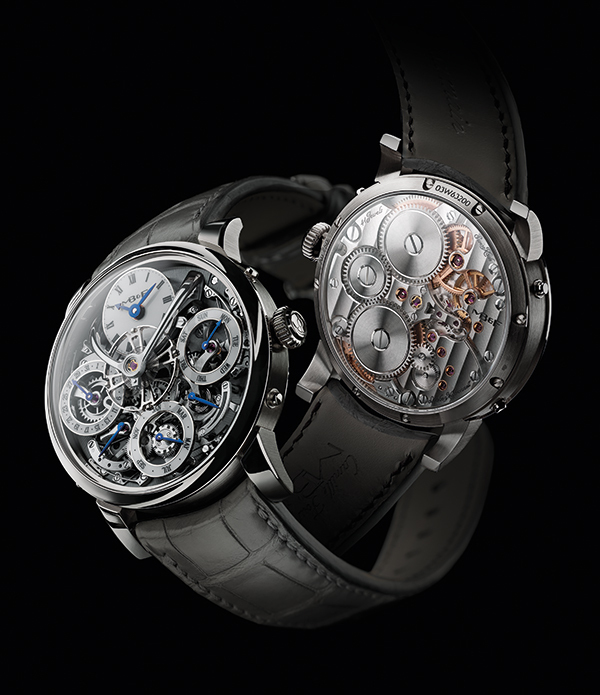 Still, this timepiece takes it a step further by simultaneously indicating both using two easy-to-read minute hands. 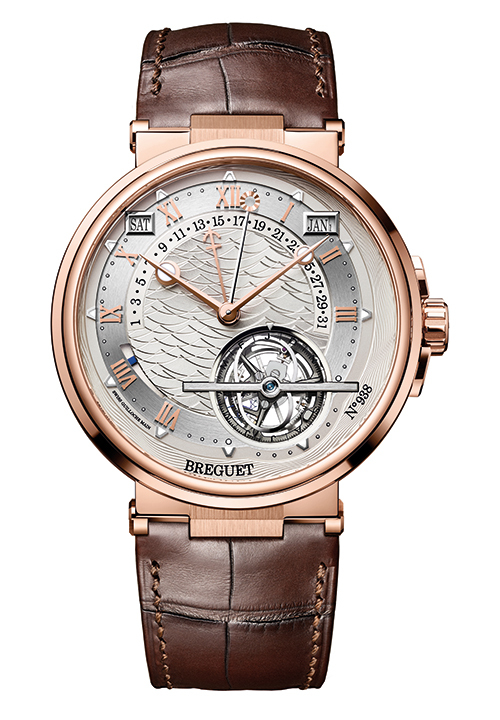 Its engine-turned gold dial features a wave pattern while the caseback is adorned with a complex depiction of the Royal Louis, a first rank vessel in the French Royal Navy. The brand reaffirms its supreme mastery of chronographs with its own split-seconds chronograph movement, protected by two patents, in the Navitimer Rattrapante. Equipped with a 45-mm case, the watch is offered in steel and in a 250-piece red-gold limited edition equipped with a transparent caseback. 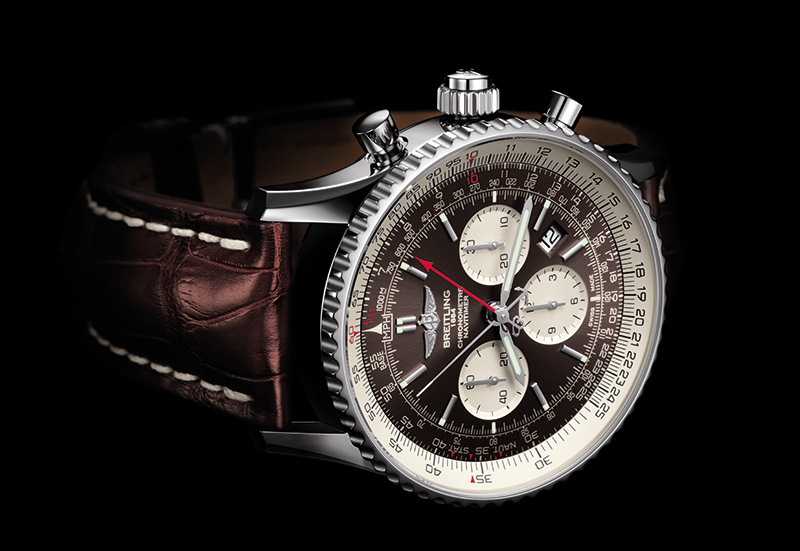 Both versions are distinguished by bronze-colored dials, serving as a backdrop for silver-toned counters and an inner bezel reflecting the classic Navitimer look. Chronograph A merger of the Greek words ‘chronos’ (‘time’) and ‘graph’ (‘writing’), the word itself translates to mean ‘time writer’. Essentially the classical term for a stop watch, chronographs tend to employ independent hands and smaller sub-dials on the main dial. They’re typically precise enough to measure down to one fifth of a second, while some go to one eighth or one tenth of a second. Rare ultra-precise models can measure one hundredth to one thousandth of a second. Tourbillon Patented by watchmaker Abraham-Louis Breguet in 1801, it was invented to resolve peculiarities in pocket watches — which were carried in a gentleman’s waistcoat and constantly subjected to changes in position. The remarkable feat of engineering counters the effects of gravity by housing the entire escapement in a continually-moving rotating cage, thus cancelling out any timing variations. Perpetual Calendar One of the most useful complications in horology, it enables one to track the date, day of the week, month, year and even leap year with unparalleled ease. Plus, it only needs to be adjusted once a century! Moon Phase Originally designed to track crop harvests and religious ceremonies, and to determine ocean tides, it indicates whether there will be a full, half, quarter or new moon in the sky above. It first made an appearance on pocket-watch dials in the late 19th and early 20th centuries. 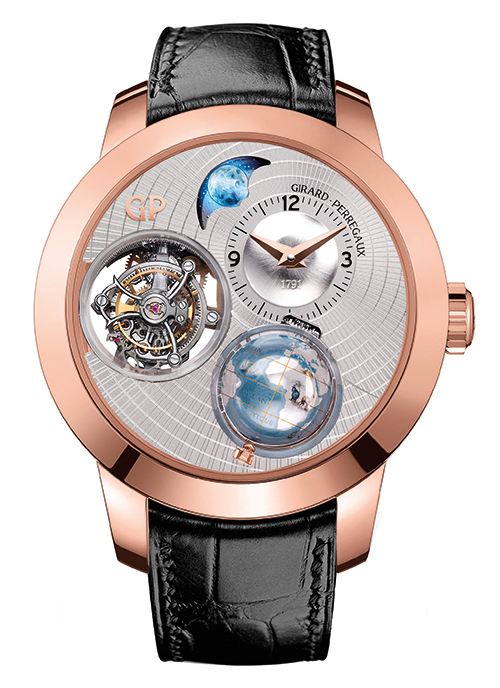 Grand Complication Given that such a creation is highly complex and incomparable, no official rules or definitions exist. What is unofficially yet commonly accepted, though, is that in order to be able to flaunt the title, a watch must feature at least three, if not more, horological complications.